There are more treasures that can be found under the water other than sea creatures with ancient civilizations preserved down below. The underwater worlds still have a lot of things hidden that we, people, would want to discover. Some of them are never-seen-before creatures and some are treasures that are filled with rich histories. With the stints of researchers, more and more of these buried mysteries are being uncovered and now, another world beneath the water has just been revealed to the world above. 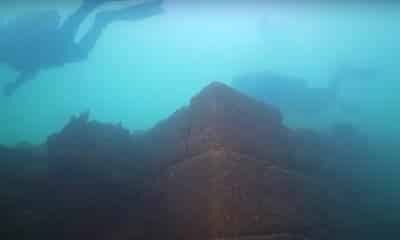 A team of researchers, divers, and underwater photographers discovered a mysterious castle at the bottom of a huge lake in Turkey. They estimate the castle to be 3,000 years old which was hidden for so long beneath the water of Lake Van in the country’s eastern Van Province. Ruins of a 3,000-year-old castle were discovered by researchers under a huge lake in Turkey. The stone fortress is reportedly about 1 kilometer (0.6 miles) in length. The walls of the castle reach 3 to 4 meters (10-13 feet) high. The ancient structure is mainly made of cut stones so it is believed to be from the Urartu civilization which existed during the Iron Age. The civilization was referred to as the Kingdom of Van and is said to have reached its peak between the 9th and 6th centuries BCE. The fortress stretches to a kilometer long so it is believed to house thousands of people in the ancient times. Other than the castle, divers were also able to discover these fairy chimneys from the same lake. “It is a miracle to find this castle underwater. Archaeologists will come here to examine the castle’s history and provide information on it. The study reinforces the idea that spanking is and will never be an effective technique for disciplining kids. You probably can still remember the way your parents disciplined you in the past. They could have done it through words or perhaps, the most common of all, they spanked you. In our modern world today, however, the term spanking comes with a bad rap. And everywhere it gets tossed, people come out and suggest different views. Interestingly, over the past few years, researchers have gathered all scientific evidence suggesting that spanking could only make a child’s behavior worse. This was courtesy of a team of psychologists at the University of Texas at Austin and the University of Virginia. They found out that kids who got spanked by their parents were more likely to acquire behavioral problems. A new study suggests that spanking can only create behavioral issues. The images only prove that humans were already training and domesticating dogs in archaic times. Researchers have always believed that dogs were once considered a wild animal and that their looks and built were not similar to how they look now. However, experts are now close to finding the truth behind these creatures. Somewhere in the northern part of Saudi Arabia, the researchers obtained what appears to be the earliest depiction (engraved) of dogs. While it is interesting in some ways, experts are still not convinced of it. One of the images depicting the earliest forms of dogs. The pain doesn’t end after the glove has been removed. Every country has its own tradition of welcoming young people into adulthood. There are the likes of a bar mitzvah for Jewish boys or a celebration for a girl’s sweet sixteen. Some parents would allow their children to experience things on their own to let them survive through adulthood. In some parts of the world, however, particularly in the Amazon, a coming-of-age ceremony for one tribe requires a young man to be subjected to an unimaginable pain - stings from bullet ants. This ceremony has been practiced by the indigenous Sateré-Mawé tribe of the Amazon rainforest to teach young men about suffering and to prepare them for all the dangers in the jungle. The bullet ant is an ant species that is believed to produce the most painful sting among insects.